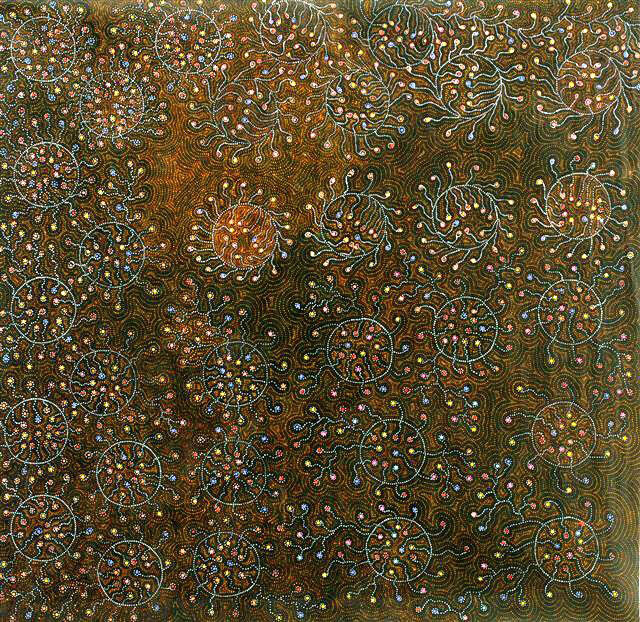 Julie Pangata's finely executed, intricate work is painted from a traditional perspective. She surveys her landscape with a spiritual eye deriving much of her inspiration from her Dreaming - the Bush Plum. Her bejeweled-like paintings depict the Bush Plum (Arnwekety) plant as it flowers into maturity across her country. The dot-like appearance of shrubs, spinifex and other grasses all over her country provide a great source of inspiration to Julie Pangata.